This creation of this stunning guitar was commissioned by the Grand Ole Opry to celebrate 80 years of great country music. There were only 80 guitars made. 40 of which were given to Opry members and the remaining 40 were sold to the public. 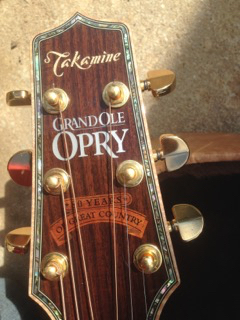 Here is a Grand Ole Opry 80th Anniversary Model Takamine Guitar. This is a wonderful guitar and in a brand new condition. This price includes delivery within Australia including insurance and first class transport to its destination. Buyer will accept Visa or Mastercard through Paypal. For more than half a century now, Takamine has proudly dedicated itself to the art of fine guitar craftsmanship. Its long-standing devotion to innovation and continual improvement has placed it among the world’s premier acoustic guitar makers, with truly fine instruments that are the first choice of performing guitarists worldwide. With humble beginnings in 1959 as a small family-run guitar shop nestled at the foot of Mount Takamine in the central Japanese town of Sakashita, the fledgling company took the mountain’s name in 1962 and began in earnest the journey that led to the phenomenal success that is the modern Takamine company. The timeline here outlines that remarkable evolution.